Do you recognise this man? Police would like to speak to him? A late night raider took away more than a sandwich after breaking into a Hamble Cafe – the cheeky burglar made off with the entire safe. 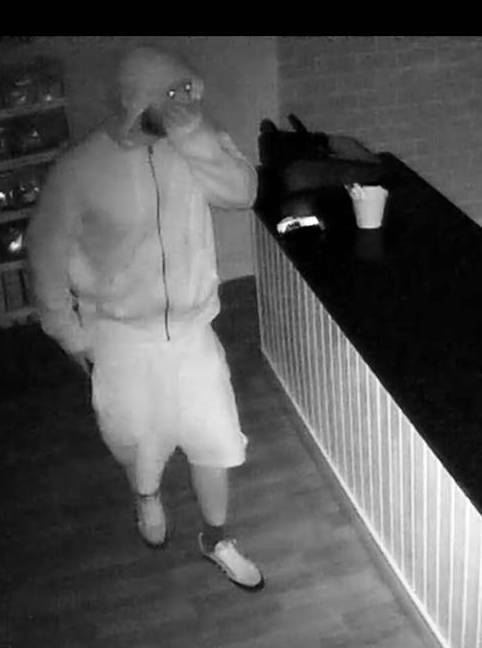 The burglary happened at some time between 10.15pm on May 19 and 6.20am on May 20 at the Flying Boat Café, Ensign Way, Hamble. Police say a suspect smashed open the front door and once inside searched the café before making off with the safe which contained a quantity of cash. “We’ve released a CCTV image of a man we want to speak to in connection with this incident. He is wearing a hooded top and Adidas trainers; he has a beard. Do you know who this man is? “Ensign Way leads to an industrial estate with businesses that operate 24 hours a day. The road can be busy even throughout the night. Were you in the area at the time? Did you see this man or witness anything suspicious? Anyone with any information is asked to contact PC Wickes at Hedge End police station by calling 101 or call Crimestoppers on 0800 555 111, where information can be left anonymously.